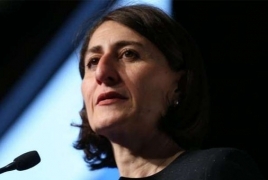 PanARMENIAN.Net - New South Wales Premier Gladys Berejiklian has talked about her parent in a fresh interview with The Australian. The premier has previously spoken about how all four of her grandparents were orphaned in the Armenian genocide and how 40 relatives lost their lives. She said her father, Krikor, was born in Aleppo, Syria, but he didn't want to raise a family in the Middle East so he moved to Australia in the 1960s, where he met Arsha. "My parents are both really smart people, neither of them got a chance to finish high school. Life is precious. My motto's always been: 'Try to make a difference'," she said.